1. 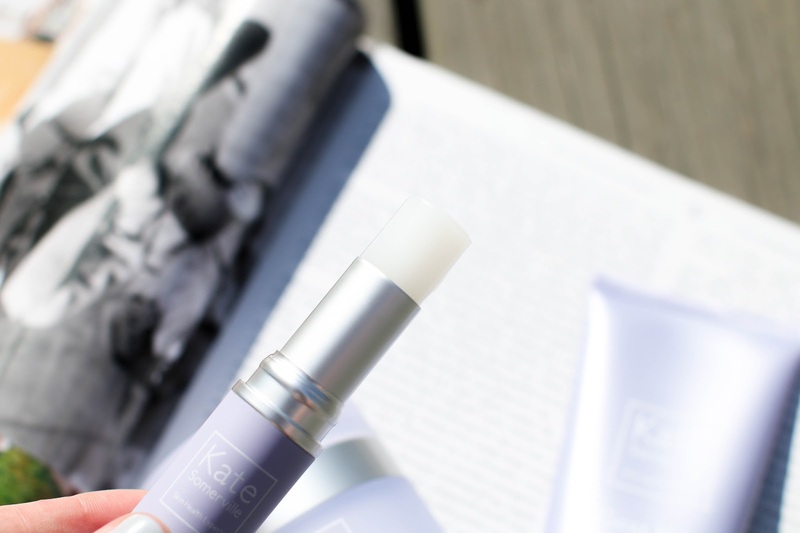 Kate Somerville Goat Milk Eye Balm - I have a ton of eye creams in my collection, but frankly this is one of the only stick balms. Initially I was worried it would feel greasy or slimy under the eye (we all know by now I am quite judgey during my first impressions with products), but after the first swipe I fell intensely in love with it. It felt cooling, soothing and calming to my under eye area, and find that it does wonders for puffiness especially in the morning when I first wake up. During my recent road trip, I would actually keep it on my bedside and apply it in the morning to help soothe my eyes (I wake up with them puffy and sensitive many mornings). I can see myself keeping this in my bag when traveling because it's a great touch up product to help instantly hydrate under my eyes. 2. 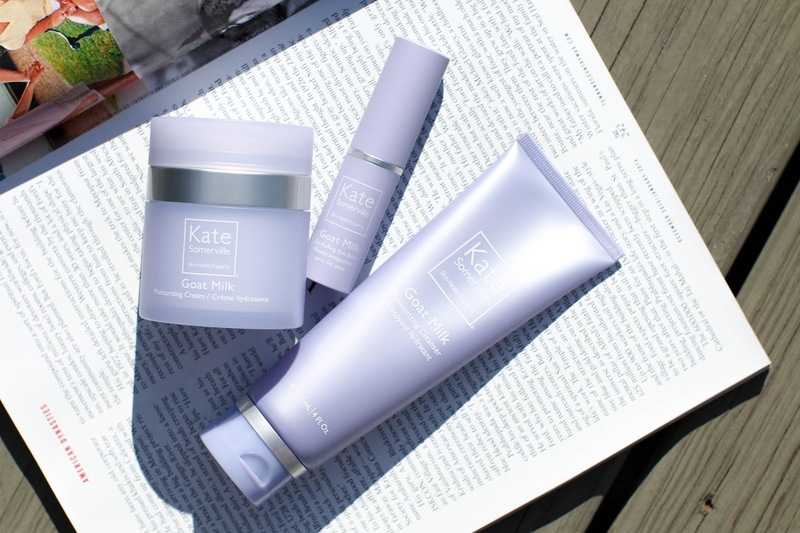 Kate Somerville Goat Milk Moisturizing Cream - There has definitely been a divide on opinions of this new Goat Milk moisturizer formula. I happen to fall into the "like" camp and this new formula still works really well for my skin. It continues to hydrate intensely and does wonders when my skin is feeling sensitive or irritated. However, I used to prefer the old formula as my morning moisturizer under my makeup, but with the new release I save it for evenings mostly. I can get a bit shiny during the day when using this one, which is why I like to save it for my nighttime routine. 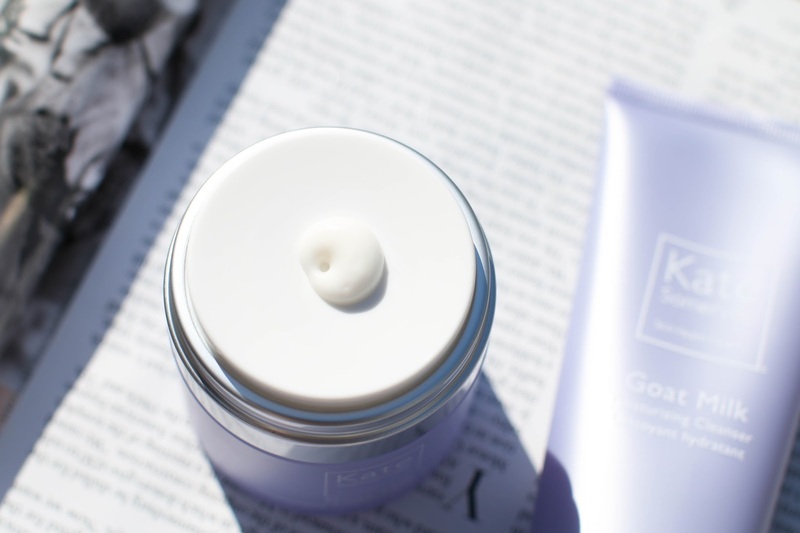 That being said, it is still a staple in my skincare collection and helps to replenish any moisture loss I had during the day and I wake up with incredibly soft, smooth and glowing skin. 3. Kate Somerville Goat Milk Cleanser - I know it's a bit early, but this cleanser has already made its way into my favorites. The texture is one of the smoothest, decadent yet effective balms I have tried in a long time. I prefer to use it as a second cleanse because I don't want to waste it on removing makeup, BUT I have to say it does a phenomenal job at it. I can get off almost all of my makeup (some mascaras still require an oil) with this cleanser. During the course of my trip, I have been using it as a treatment by massaging it into the skin and leaving it on for 3-5 minutes, then removing with a warm washcloth. I have found that my skin responds so well to this technique - afterwards it looks radiant, fresh, hydrated and incredibly even. I test out a ton of cleansers, but there are only a select few that I will choose to repurchase. THIS will be on my repurchase list for sure. Hi Maree, when you say you massage the cleanser into your skin and leave on (almost as a mask) do you do this on dry skin or wet skin? Thanks so much! I use it on very lightly damp skin, or dry skin - either one!